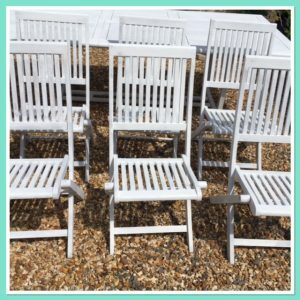 To paint garden furniture or not to paint garden furniture, that is the question. I’m currently in the process of making my garden an outside room, rather than an area of weeds that you just walk through to get to the house. A garden would not be complete without a place to sit and relax, so I took to Pinterest to gain some inspiration. 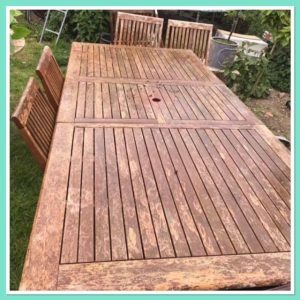 At this time of year, you’ll notice people selling their unloved wooden garden furniture sets in order to make space for their new outdoor living furniture. It seems that grey rattan furniture is “in” and wooden furniture is “out”. It’s not because rattan is more superior to the wooden furniture sets but most people do not have the time to maintain the wooden look either by painting or staining. I saw this unloved extendable table and six chairs for sale, the situation was just as described above. 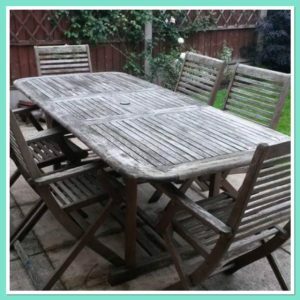 The family had ordered a new rattan garden furniture set and the old wooden garden furniture was now redundant. Obviously this set will not fit in a car, so if you are thinking about taking the challenge to paint garden furniture then either get hold of a 4×4 or trailer to be able to collect one. A few days later, I saw another wooden furniture set including 6 chairs for sale. These chairs had arms so I decided to take 2 chairs from that set and create a set with 8 chairs. Before you run for the paint brush, first of all start by sanding and cleaning each of the chairs and the table. You can use an electric sander but I find it easier to use a sanding block to get into the smallest of places. Next, use a hand brush or paint brush to get rid of any dust or cobwebs. Now it’s time to create a base coat, you can get grey primers but I knew that I was going to be using a light coloured paint so I opted for a white primer. I used a Diall Primer which was suitable for interior and exterior. Although the reviews on the website were not all positive about the primer, I didn’t have a problem and I only needed to apply one coat (thank goodness). Now the fun starts because it’s time to add colour. 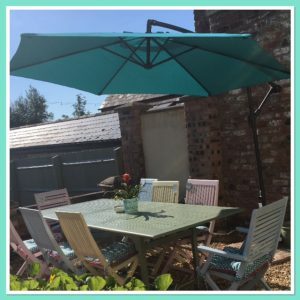 I decided to use Cuprinol Garden Shades paint, I’ve used it before and I like the product. 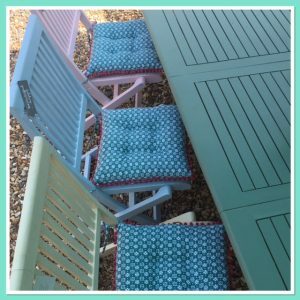 The table was painted using a shade of green called Willow, I then used three different pastel shades for the chairs: Coastal Mist (baby blue), Country Cream and Sweat Pea (baby pink). I then dressed the table and chairs. I considered making my own cushions but I found some ready made ones and they looked great so I went for the easy option. I then found a plant pot to match the cushions and a turquoise parasol that coordinated too. 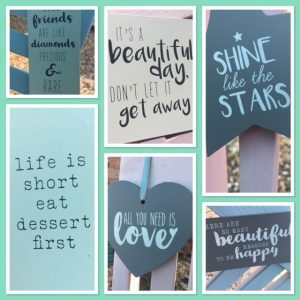 The pastel summer look was finished off with attaching a small sign to each chair. Parasol purchased from B & Q on sale reduced to £55 ( you will need 4 slabs to weight the parasol down). 8 cushions from Matalan, 2 for £12. Next Post Housing Politics: Where does each party stand?